Pre-and Post-study all the athletes completed a 1 Repetition Maximum (1RM) bench press assessment. Post-study, both groups saw an average percentage increase in bench press 1RMs, but the differences between the two groups were minor, and as a result, the results inconclusive. This mini-study compared a classic, body-building-style Pyramid Progression versus a modified version of MTI’s proven Big 24 progression on the bench press exercise. A classic Pyramid Progression deploys percentage based loading with a set rep scheme that begins with higher reps, and a lower load at the bottom of the pyramid, decreases reps and increases load as the athlete works up the pyramid, then works back down the other side of the pyramid by increasing reps and decreasing load. 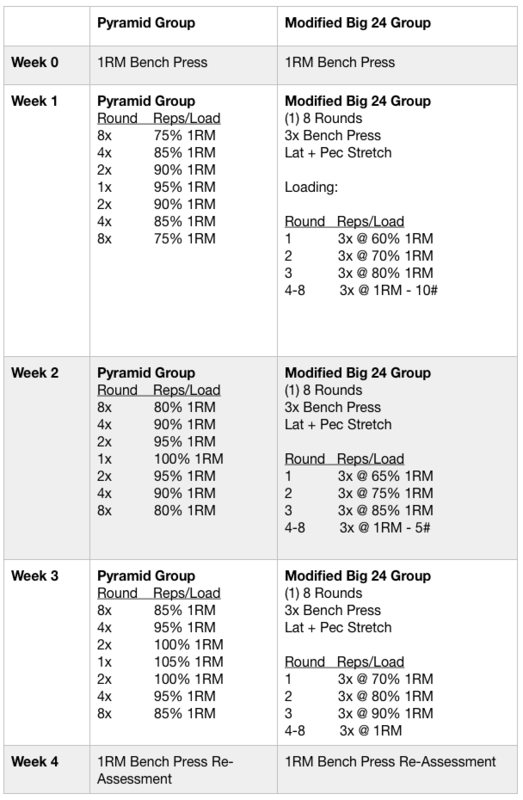 On a whim, last winter, a group of older MTI lab rats (40 years + in age), including myself, completed a 3-week cycle of this pyramid progression for the bench press – with overall fairly good results. The Modified Big 24 progression here deployed our classic Big 24 set/rep scheme and loading to a 1RM bench press effort, rather than the typical, 3RM effort. The lab rats completed their respective bench press progressions two times/week during this mini-study – on Tuesdays and Thursdays. Overall the Pyramid Group saw an average 4.5% increase in bench press 1RM, but this result was skewed up by one outlier – Emmett – who saw an 11.1% increase. The female athlete in this group, Emily, saw no change in her 1RM bench press. 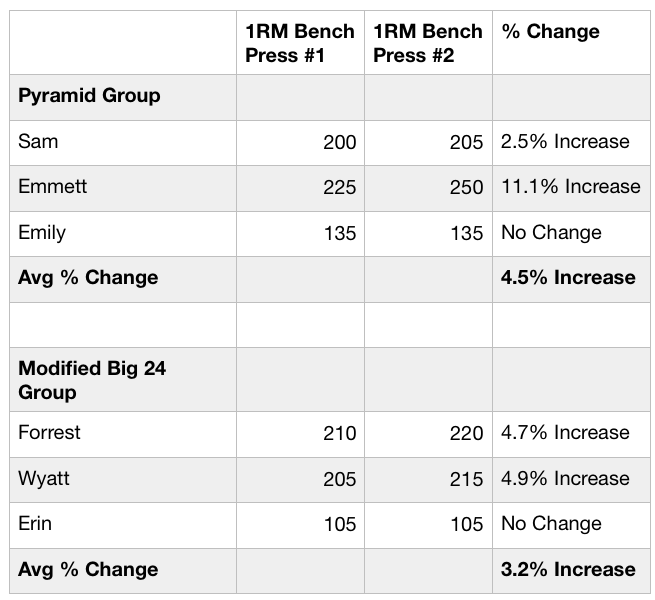 The Modified Big 24 Group saw an average 3.2% increase in bench press 1RM, but again, the female athlete in this group, Ally – saw no change in her 1RM Bench Press. 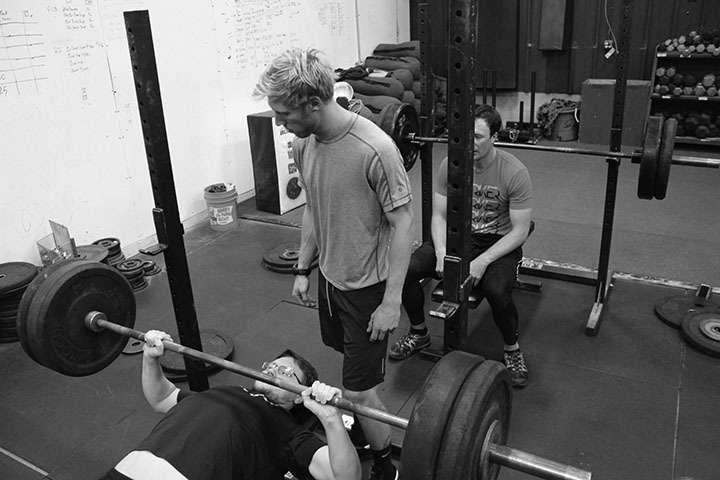 Overall, the 4.5% bench press 1RM increase for the Pyramid Group and the 3.2% increase for the Modified Big 24 Group were too close to identify a clear progression winner – especially given the few number of athletes involved. Despite the inconclusive results of this mini-study, I’m intrigued by the Pyramid Progression and plan to conduct another progression comparison mini-study with a leg exercise – front squat or back squat, sometime this winter. From my youth, I remember many Pyramid Progressions in high school strength training sessions and body-building magazines which certainly seemed to get me stronger. Comparing this progression to one of MTI’s proven progressions but for a leg strength exercise is worth the effort.